Wests Tigers' superb start to 2018 continued on Sunday as Luke Brooks masterminded an emphatic 38-12 away victory over Manly Sea Eagles. 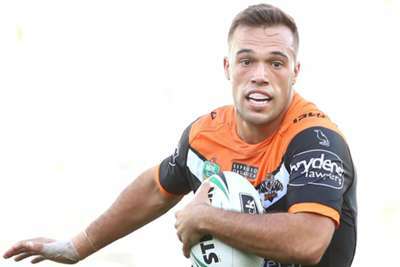 Half-back Brooks laid on three of his team's four first-half tries and scored the other as the Tigers surged into a 26-0 lead by the interval. Manly were booed off by their frustrated supporters and fell further behind early in the second period as Benji Marshall, Brooks' half-back partner, claimed his second try of the game. Joel Thompson and Brad Parker claimed consolation scores, but the Tigers – who brought on Josh Reynolds for a long-awaited debut – fittingly had the final say as a penalty try rounded off their fifth victory in six matches. The @WestsTigers continue their impressive start to the season with a 26-point win over the @SeaEagles. Penrith Panthers also made it five wins from six in routine fashion on Sunday, although their 35-12 win over Gold Coast Titans was soured as Josh Mansour suffered a suspected fractured cheekbone. The Panthers were only 10-6 up at the break but surged clear in the second half, with James Maloney pulling the strings.